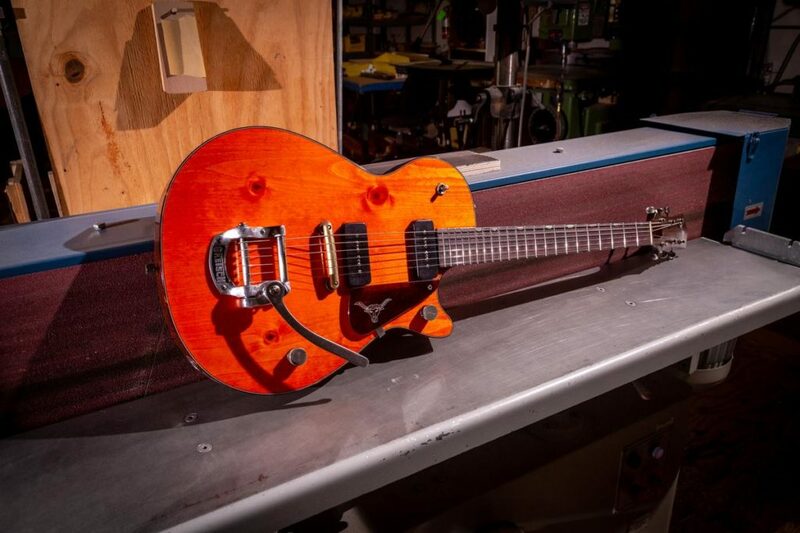 Every time we visit the Gretsch Custom Shop in Corona, Calif., there are so many new wonders to behold from Senior Master Builder Stephen Stern and his crew. Many of those fine creations debuted last week at our annual Custom Shop NAMM event, and we are delighted to spotlight them here. 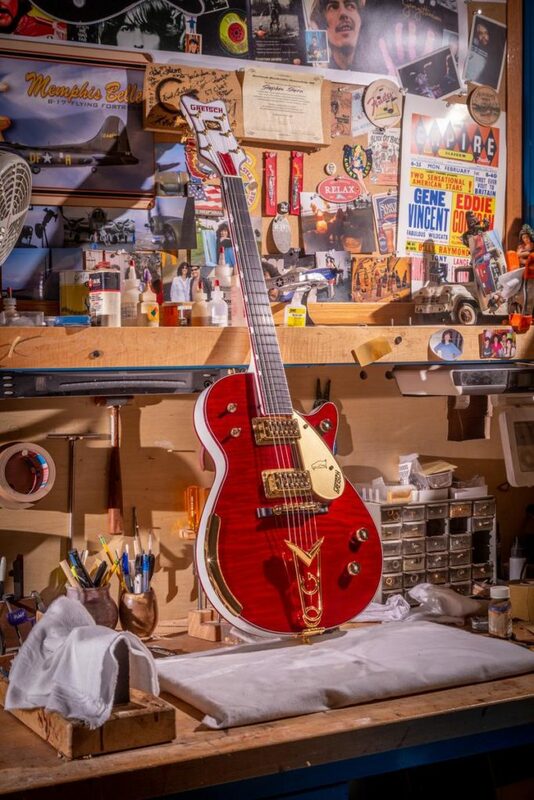 This fashionable bird gets suited up in a Trans Ruby Red curly maple top to commemorate the shop’s 15th anniversary. 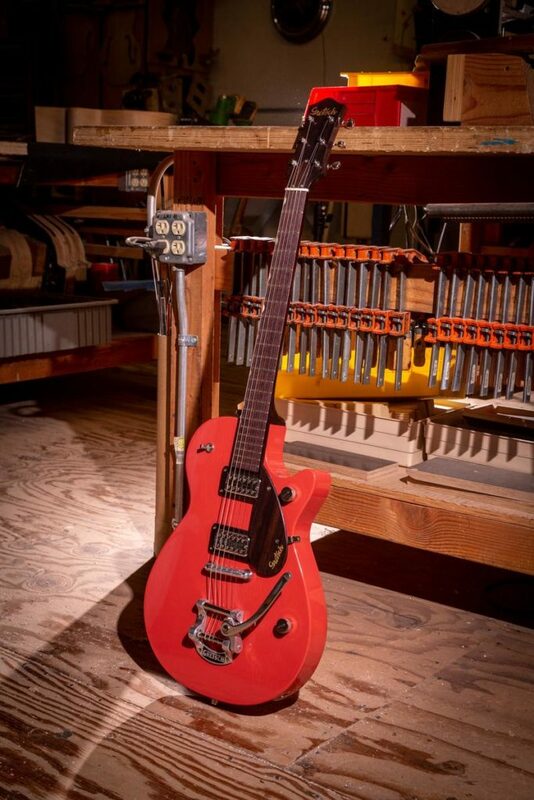 Constructed by the renowned Master Builder Stephen Stern, the mahogany sides, back and neck of this model are finished in white and wrapped in ruby red sparkle binding, while TV Jones® Ray Butts Ful-Fidelity pickups make this guitar sing with plenty of vintage snap. Gold hardware including a “G” Cadillac tailpiece and armrest adds the finishing touches on this remarkable instrument. Yet another breathtaking custom design by Master Builder Gonzalo Madrigal, this custom G6134 ’59 Penguin features a ziricote top over a rosewood body with mahogany back and sides. This magnificent creation has tortoise binding around the mahogany neck and headstock, while its ebony fingerboard has 22 vintage frets with engraved humblock inlays. Think classic twang all day long from the gold plated TV Jones® Classic pickups. Jeweled G-arrow knobs, a gold Penguin-crested pickguard and a “G” Cadillac tailpiece round off this model in unparalleled Gretsch style. This ’59 Penguin does the walking and the talking in a statement-making flame maple top with flame maple body, neck and headstock binding. Adding even MORE elegance, the Custom Shop even went with flame maple thumbnail inlays in the ebony fingerboard and a flame maple pickguard with the Gretsch and Penguin logos etched in. It’s a true work of art in a Tiger Eye Stain finish, topped off with gold hardware. Bareknuckle Emerald bridge and neck pickups give this G6134 with V-Stoptail plenty of wide open high-end tone. This baby is one you’ll definitely want to take for a joyride. Built by Custom Shop team member Kyle Kessler, this G6128 ’59 Custom Duo Jet was inspired by the ’59 Bonneville Triumph motorcycle. 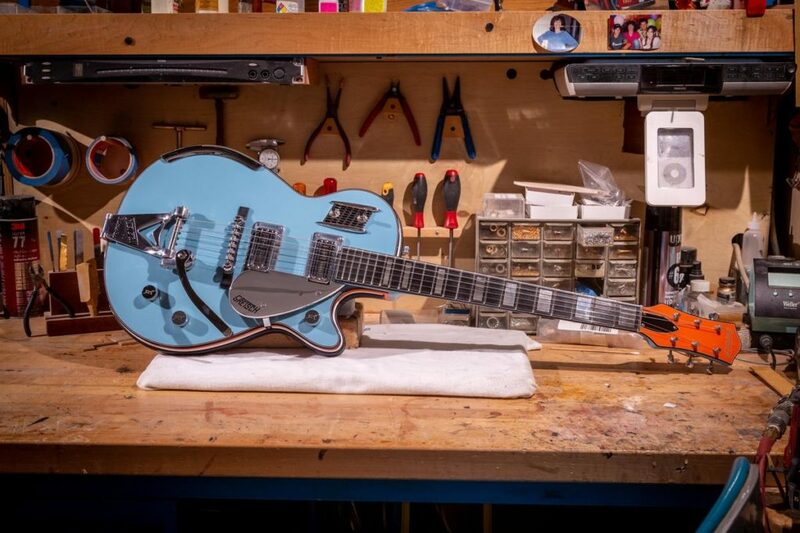 This imaginative creation sports a Sonic Blue finish with Gretsch orange headstock and sides, which feature black and white leather piping. To add to this Jet’s extraordinary flare, Keesler went with polished aluminum pickguard and block inlays on the ebony fingerboard, plus a switch plate with a replica gas tank badge. TV Jones® Super’Tron pickups give this model a kick with more output that accentuates the lower range. 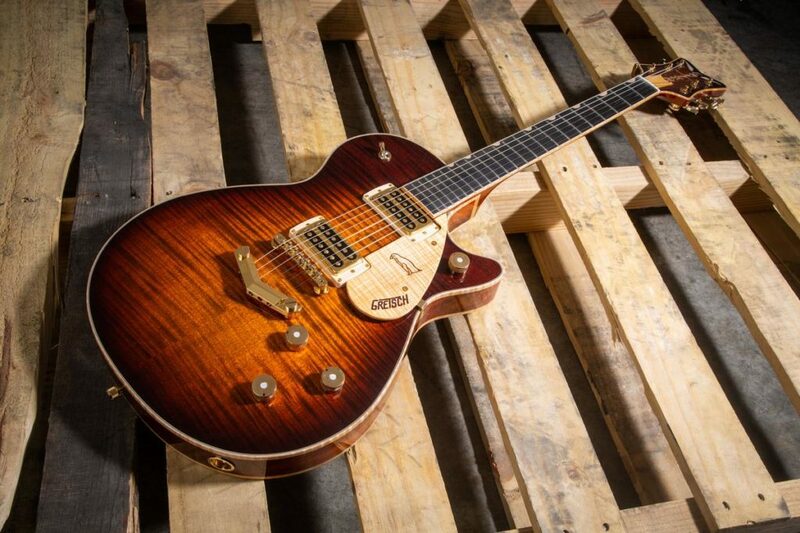 From the imagination of Gretsch Custom Shop “relic man” Bill Jancar comes this G6136T, a heavy relic Falcon Jr. “modified” beast that features a Lolla P-90 neck pickup and Lollar’Tron bridge pickup. 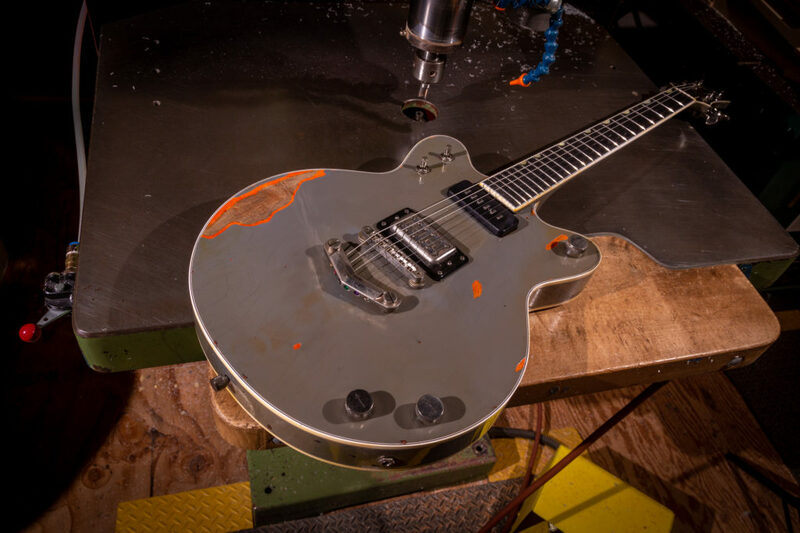 Originally stained Orange, this guitar got dunked in Grey and then Jancar went to town with his relicing, stripping away the grey until some of the orange and even natural finish show through. Marking his first-ever NAMM piece, it’s an incredible re-imagined battle-hardened axe that is ready to rip! This stunner is one that we wish everyone could see in person as pictures just don’t nearly do the exquisite flame koa body of this model justice. Constructed by Gretsch Master Builder Gonzalo Madrigal, this Broadkaster Jr. is finished in Koa Burst with aged white body and neck purfling. Voiced by Full’Tron® pickups, this knockout creation is completed with gold hardware including a Bigsby® B3G tailpiece and Adjusto-Matic™ bridge. 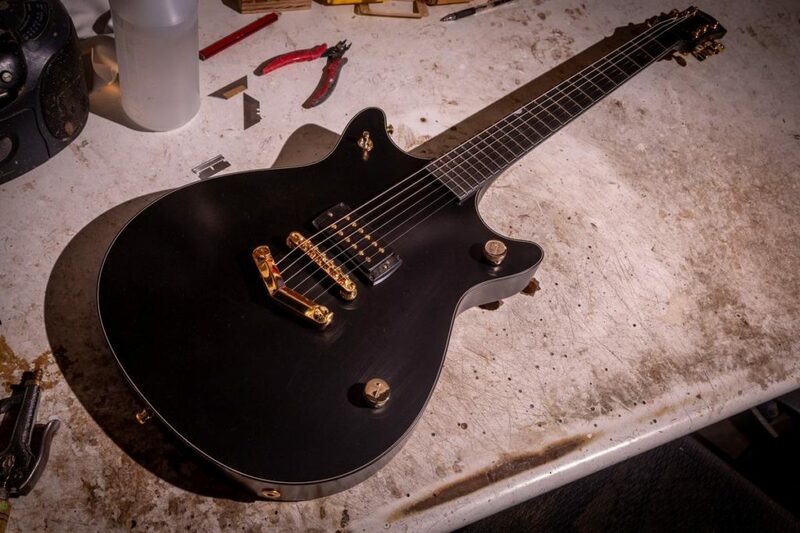 The classic ’62 Double Jet undergoes custom shop treatment for a sleek and stealth axe ready to soar and rage with a single Bareknuckle Juggernaut bridge pickup. 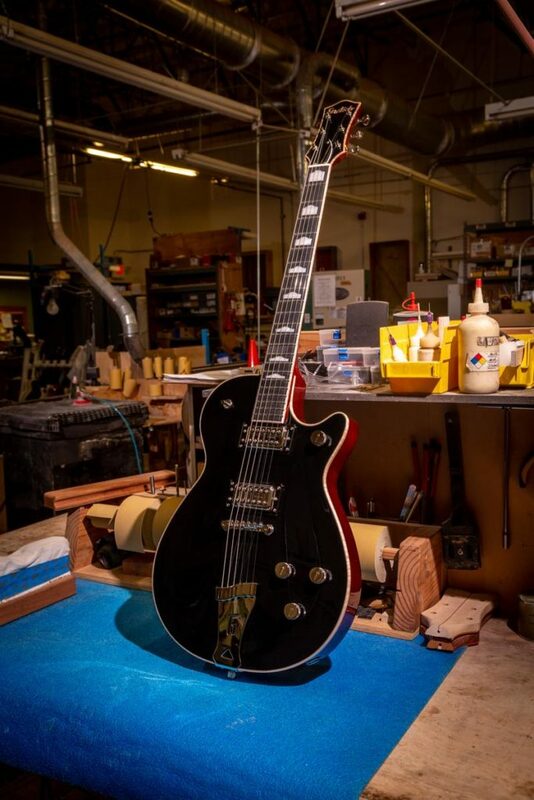 The ’62 double cutaway mahogany body sports a stately satin black finish, accented by black binding with cream purfling, and is paired with an ebony fingerboard. 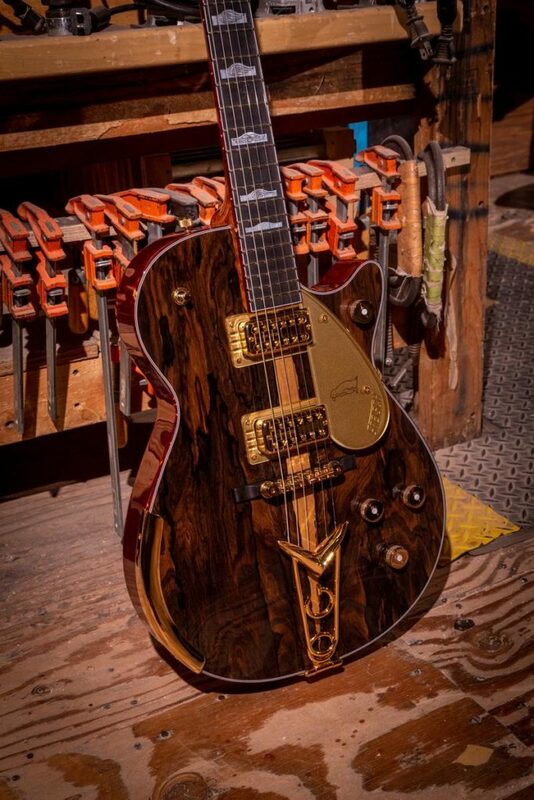 Gold hardware, including a V-Stoptail, Adjusto-Matic bridge and G-arrow knobs complete the look. Another beautiful design by Master Builder Stephen Stern, this dashing G6120-61 Chet Atkins ’61 Nashville features one of Stern’s favorite woods with curly maple top, back, sides and neck — all dressed in Trans Black. 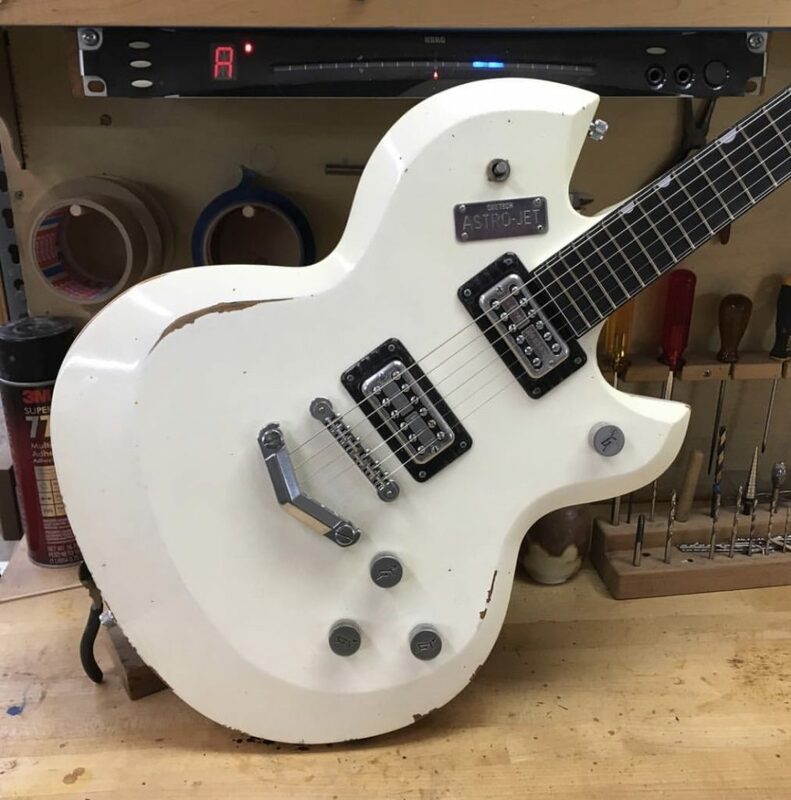 The body, neck, F-holes and headstock are wrapped in white motto binding, and the ebony fingerboard is fitted with Stern’s own designed diamond mother of pearl inlays. TV Jones® Ray Butts Ful-Fidelity bridge and neck pickups give this extraordinary model its bright voice, while the chrome Bigsby drives added shimmer. 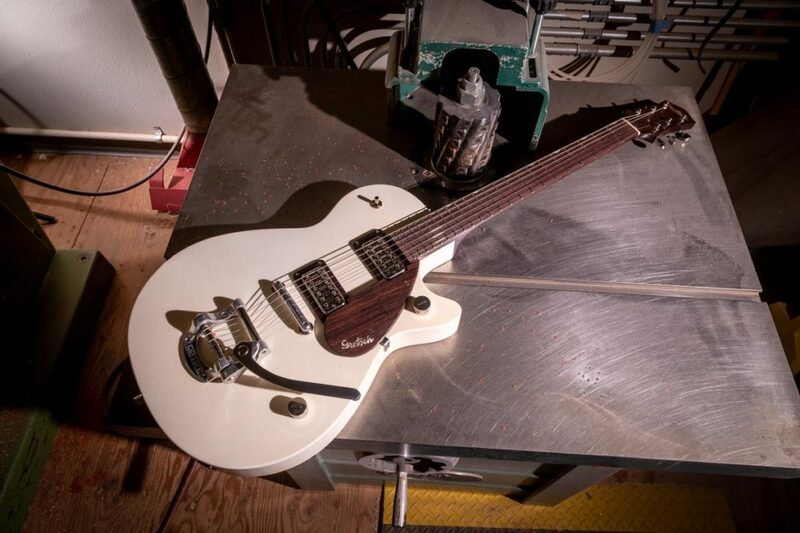 The mahogany flat top body of this ‘G6210 custom ’59 Duo Jet Jr. is finished in classic Aged White with a striking rosewood neck and fingerboard. The ’54 headstock features the script Gretsch logo in aged nitro, while the rosewood pickguard dons a gold Gretsch script logo. Nickel hardware complete with a rocking bar bridge, Bigsby B5 tremolo and G-arrow control knobs add plenty of shine, while the TV Jones® Ray Butts Ful-Fidelity pickups with rosewood inserts fuel this Jet with plenty of vintage tone. Ready for a tropical vacation? The blushing Tahitian Coral finish on the mahogany body of this ’59 Jr. Jet pairs well with the dark grain of the rosewood neck and fingerboard. An abalone script Gretsch logo adorns the ’54 headstock, with the rosewood pickguard featuring an etched Gretsch logo. TV Jones® Ray Butts Ful-Fidelity pickups atop aged nitro inserts round off this modern classic with plenty of balanced bright tones. 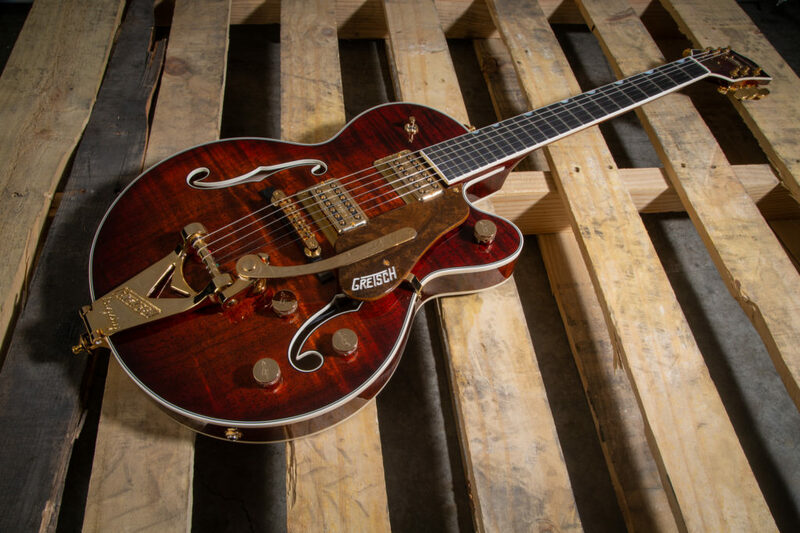 A blazing Gretsch Orange stain covers the solid knotty pine top and mahogany back and sides of this statuesque instrument, with tortoiseshell binding for an added stately touch. 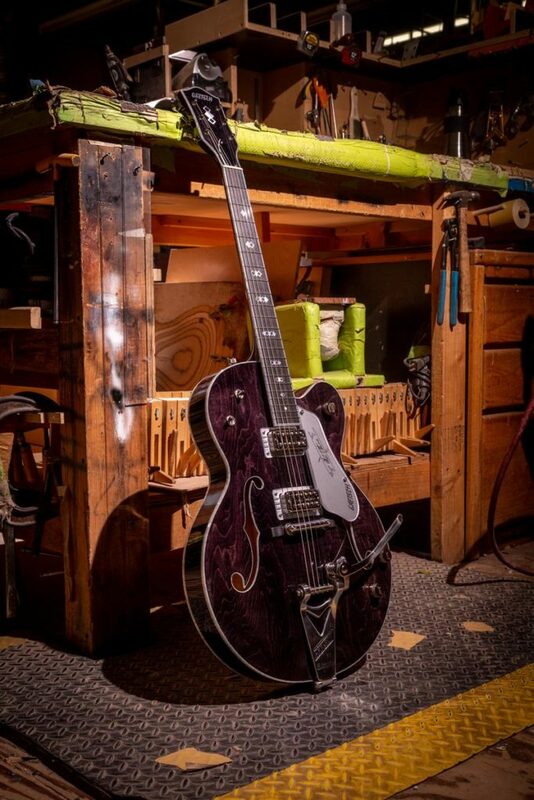 The rosewood neck and fingerboard is topped with a ’54 Duo Jet headstock featuring an abalone Gretsch script logo. The Seymour Duncan® P90 packs plenty of mid-range with just a dash of grit, while the rocking bar brass bridge and Bigsby B5 offer up endless sustain and twang. From the mind of builder Chad Henrichsen, this workhorse Duo Jet features a ’55 body with ’59 bracing and is loaded with Broad’Tron pickups that can handle anything you toss at it. The solid maple top is dressed in a classic Black finish with curly maple binding and a Dark Tobacco stain on the back, neck and sides. Nitro inlays adorn the ebony fingerboard, while a G-cutout tailpiece adds classic swagger. Remember the ’60s television show Meet the Jetsons and their dog Astro? A futuristic space-y shape introduced in 1964, this custom shop recreated Astro Jet is a marvel to behold. This space-y blast from the past features the iconic off-set Astro body in mahogany with an Aged White finish, relic’ed as if it has just been hiding in grandpa’s attic for the last 50 years. The mahogany neck features an ebony fingerboard and is topped with the the original Astro Jet wave headstock. TV Jones Power’Tron pickups, V-Stoptail, screwed on Astro Jet plate and nickel hardware complete this flashback piece.